Do you like the communication and business management tools that RICH CRM offers, but would like your clients to see your own brand instead of ours? Whether your customer base has 50 people or 50,000, we can provide a solution that will help you grow your business. Contact us at sales@richcrm.com.au and let us show you how you can have your own business management software suite up and running in just a few weeks! 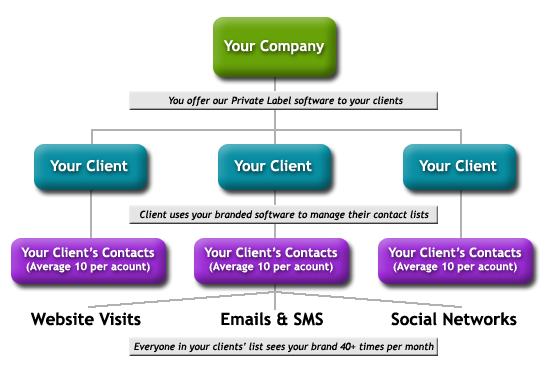 We can private-label our software to meet your company's industry specific needs and even allow you to control the advertising! You can create your very own business management software, allowing your clients to organize their businesses while constantly being exposed to your brand. Licensing is a simple process and costs are based on the amount of active users you have - big or small, this can work for you. Assume you have 1,000 clients in your database and you send them all an invitation to take advantage of your newly created business management software. Assume conservatively that 5% take advantage of this and have their own customer base that average 10 clients. 50 businesses x 10 clients per business = 500 potential clients exposed to your brand 40 times per month!! With a 5% adoption rate you will increase your potential client list by 50%. You determine the domain name you want to use (just check if it is available) and RICH CRM will manage it for you - from upgrades to support, we take care of everything! 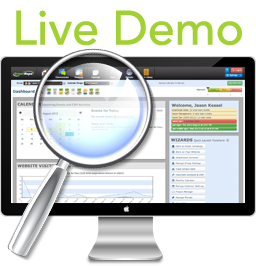 With RICH CRM, you join an elite group of marketing professionals leveraging the most powerful software on the planet. Contact us at sales@richcrm.com.au for more details and pricing information. For more instructions on how to setup your private-labeled portal, click here.